Remember those Canada goose eggs I was going on about last month? Well they taste pretty good over easy with a side of brook trout! Naah just kidding. Truth is the eggs hatched! Two of them, this morning sometime. I was just out for an afternoon stroll and saw four geese, two full grown adults and 2 little babies enjoying the bright green grass, the crystal clear waters of the Manitou and a jumbo blue sky! Absolutely, right out there on my front lawn. Its beautiful to see two parents working as a team on something as important as this. 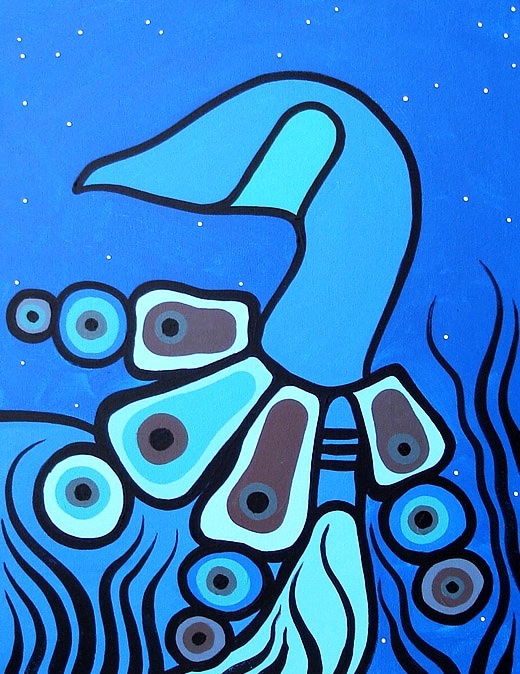 So in deference to the little ones, here is a painting brushed up many a moon ago, of the said Canada Goose! And of course influenced by the late great Carl Ray!